In the autumn we try and run a single night introductory camp which we call the Sleepover Camp. The idea is that the cubs only need the same stuff they might take with them for a sleepover at a friend's house: a sleeping bag, a toothbrush and a change of clothes. 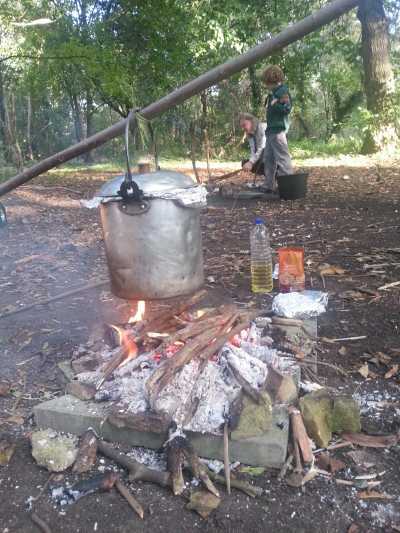 It is aimed at those who have never camped before but is open to all our cubs. 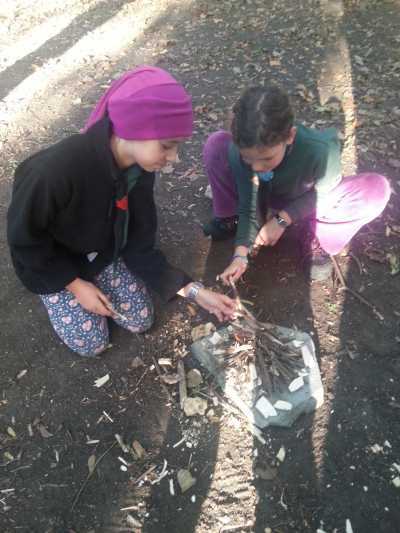 We try and include a taster of some of the fun stuff that we might get up to on one of our other camps such as lighting a fire and cooking popcorn or banarsbars (a Mars bar banana split cooked in the embers) on or in it, midnight feasts and wide games in the dark. One year we looked at the stars through a telescope, made popcorn, campfire pizzas and pineapple turnovers in the embers of our fires and slept in yurts. 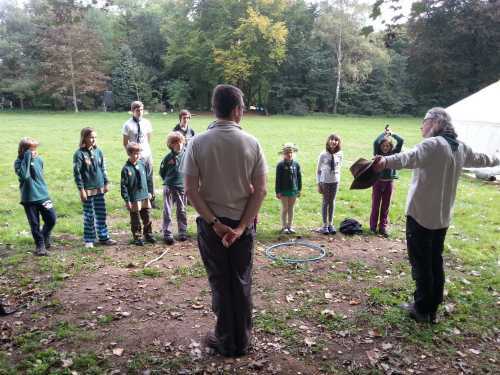 We had a go at slacklining; walking a tightrope between two trees, we went on an expedition to a park with some swings, we had some wide games including capture the flag and we had a camp fire sing-song. Another year we had our Sleepover Camp at Shepreth Wildlife Park amidst the wild animals including their tigers! We all had to know the difference between the fire alarm sound (when we had to leave the building) and the tigers-are-out alarm sound (when we most definitely had to stay indoors!). As the sleepover camp is only one night we don't get a chance to do some of the more involved activities like climbing or rafting but hopefully this camp works as a stepping stone to the longer more adventurous ones like summer camp for any cub reticent about going on camp.